Canada is already facing many challenges after their recent legalization of cannabis last week, including a significant shortage of product and uncertainties about border policies with the United States. Uruguay, which in 2013 became the first country to legalize recreational marijuana, has also faced difficulties in stabilizing and regulating this new market. Both countries face challenges in dealing with a substance they classify as legal, but which United States federal law finds illegal ― Uruguay with its banking system and Canada with cannabis workers being potentially deemed inadmissible to cross the border into America if they admit to working in the industry. 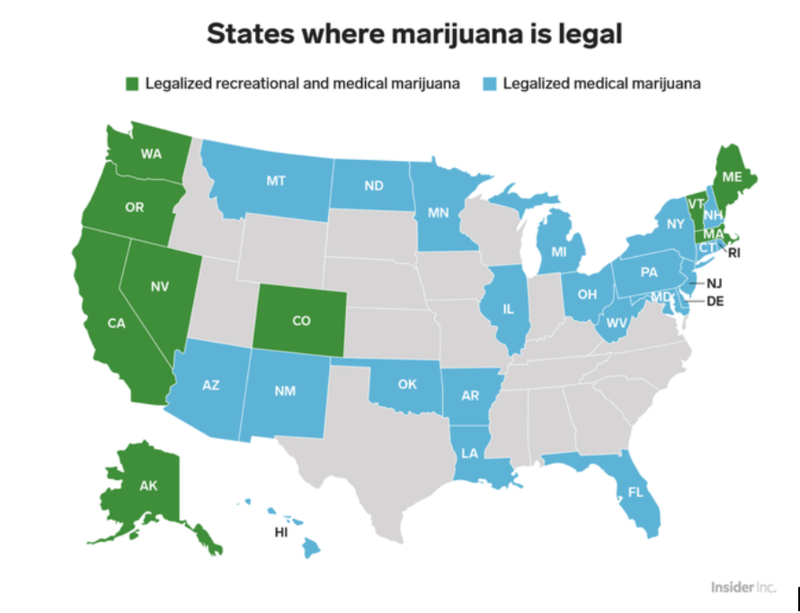 While marijuana is federally illegal in the United States, some states have legalized it for medical purposes and others for both medical and recreational use. This direct contradiction of federal and state laws has led to a messy state of affairs for the cannabis industry, where legal ambiguity and confusion about formal laws and policies are the norm even as the marijuana market’s growth shows no sign of stopping. Earlier this year, New Frontier Data forecast that the legal U.S. cannabis market ― worth an estimated $8.3 billion in 2017 ― would grow to reach almost $25 billion by 2025. Intellectual property protections in the cannabis industry have complex requirements and are often unclear as a result of these differences between state and federal law. What even is the official position of the U.S. government on marijuana products, and how does this relate to intellectual property rights? In this article, we take a general look at marijuana in America and explore various consequences of its current questionable (il)legal status, particularly in regard to trademarks. The U.S. National Institutes of Health (NIH) has funded and carried out marijuana-related research over the years, investigating its potential for abuse and its potential as a medical treatment. The U.S. Department of Health and Human Services (HHS), as a result of this research, holds a patent on “Cannabinoids as Antioxidants and Neuroprotectants,” granted in 2003. (The NIH is a part of the Department of Health and Human Services.) This patent covers the use of cannabinoids for medical treatment, particularly neuroprotective functions (protecting the brain), without psychoactive effects. The Department of Health and Human Services is licensing compounds under U.S. Patent 6,630,507 to Kannalife Sciences, a company developing cannabis-derived drugs for the treatment of various brain conditions. 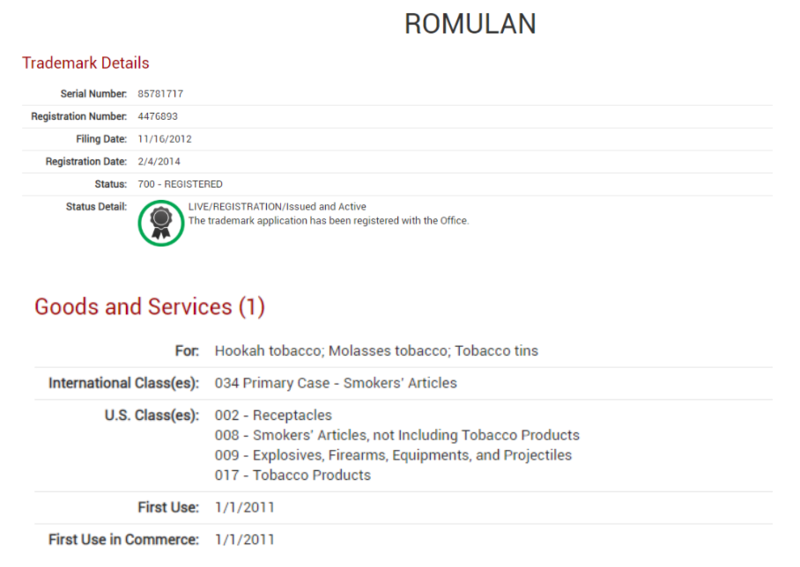 The Drug Enforcement Administration’s classification of cannabis and all its derivatives as a Schedule I substance with no accepted medical use is in blatant contradiction to the ownership and licensing of a patent based on that very substance for medical use by HHS, an arm of the federal government. In the United States, medical marijuana is legal in 31 states. Of those, nine states have also legalized marijuana for recreational use by adults over 21. Washington, D.C. also allows both medical and recreational marijuana. The laws, fees, and possession limits vary from state to state. Again, as stated earlier, as a Schedule I drug under the Controlled Substances Act, cannabis in any form (“all parts of the plant Cannabis sativa L., whether growing or not; the seeds thereof; the resin extracted from any part of such plant; and every compound, manufacture, salt, derivative, mixture, or preparation of such plant, its seeds or resin,” see CSA text here) is illegal at the federal level. Cole’s memo suggested that prosecution of “marijuana-related activity” should not be a federal priority in states that had legalized it. Enforcement and action were essentially left up to state and local officials. This “patchwork” of varying state regulations existing alongside broad criminalization of marijuana at the federal level has led to a confusing state of affairs for cannabis businesses. Conflicting legislative approaches toward monitoring and managing marijuana activity have manifested in a challenging set of requirements to consider when dealing with intellectual property in the industry. 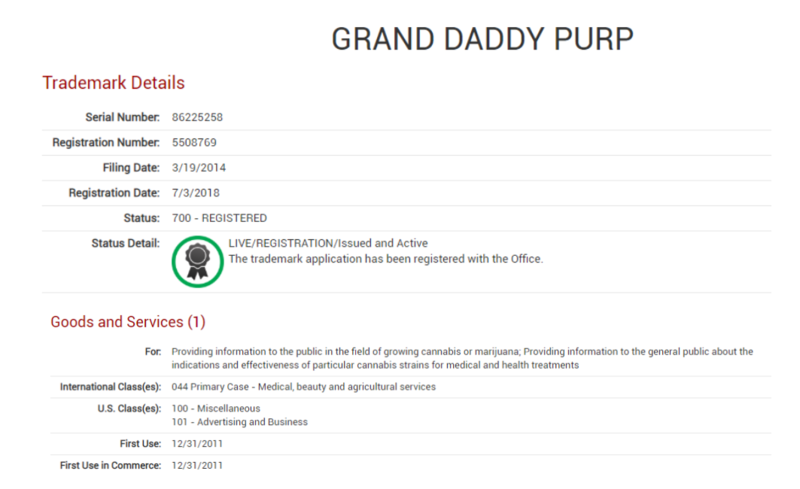 So, while it is technically illegal to file a trademark protecting the name of any product derived from or mainly containing marijuana, the law hasn’t effectively stopped people and companies from doing just that. 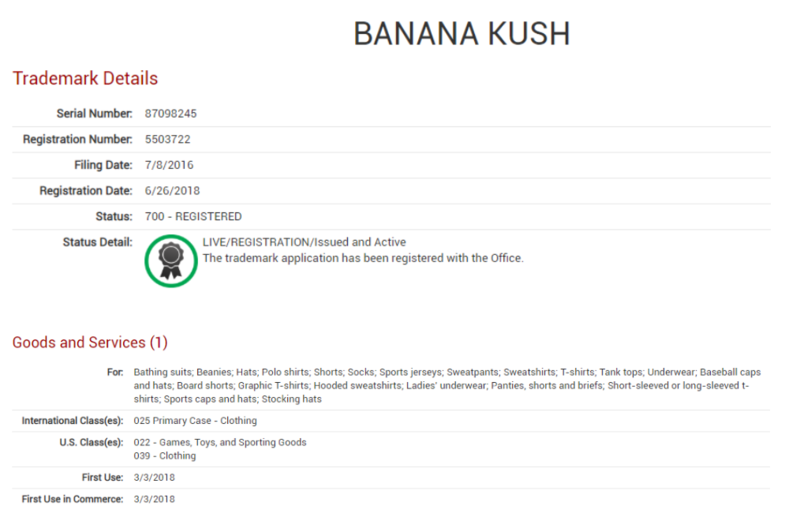 Another search of the ktMINE trademarks database with keywords “cannabis” and “marijuana” suggests an interesting industry focus on protecting custom weed-related images and graphics, and reveals an interesting innovator in the cannabis space. 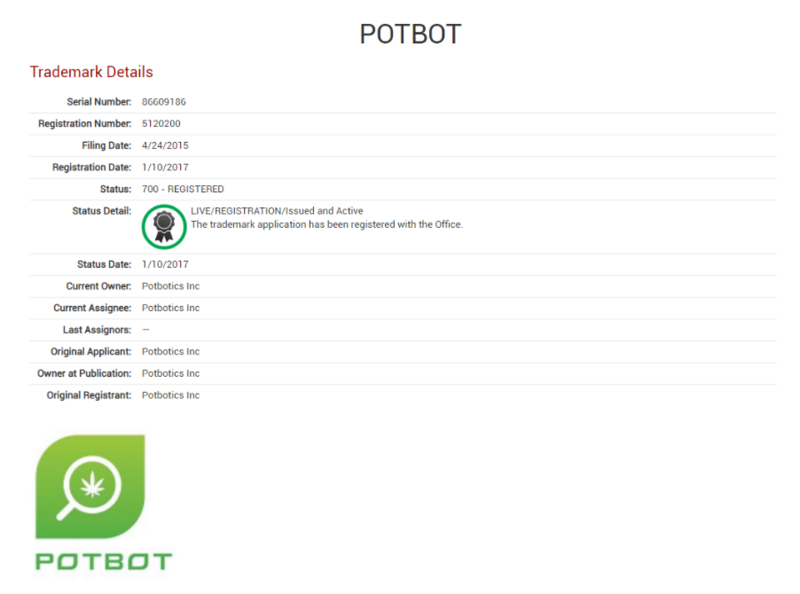 PotBotics, who owns this trademark, was founded in 2014. 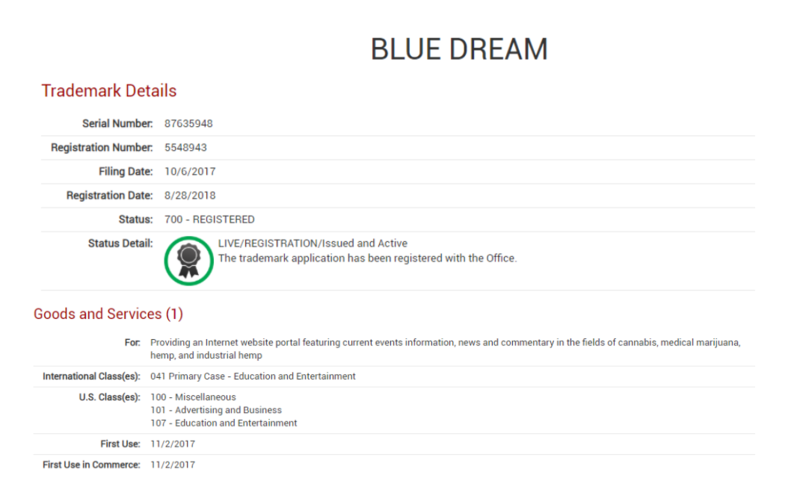 The company has a recommendation app that suggests strains and dosages to medical marijuana patients as well as recreational users under PotBot. PotBotics also provides a service to help healthcare professionals determine what cannabinoid levels are most helpful to their patients under the name Brainbot. In addition to “adding more scientific data and legitimacy to the medical marijuana industry,” the company hopes to help “provide more information and better access” to information about personalized cannabis therapy options to patients. 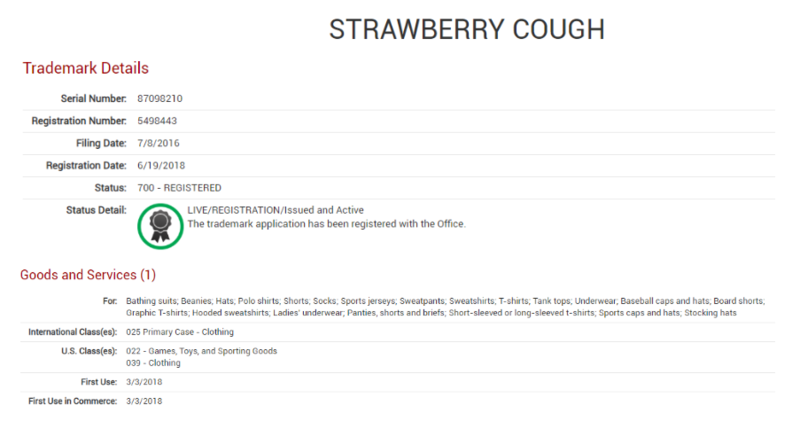 TinctureBelle and others have learned the hard way that parodying big brands more often than not leads to lawsuits and lost money. 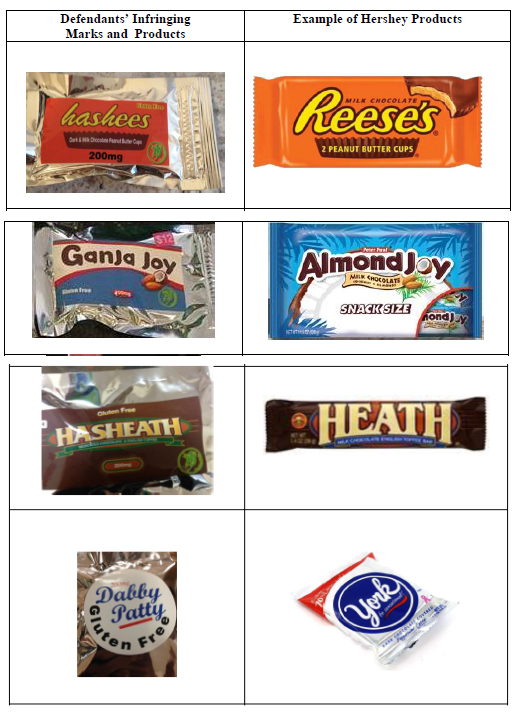 Marijuana companies must carefully consider how to best preserve the “tongue-in-cheek, alternative vibe” of cannabis culture while avoiding intellectual property violations. The cannabis industry is in a constant state of flux. 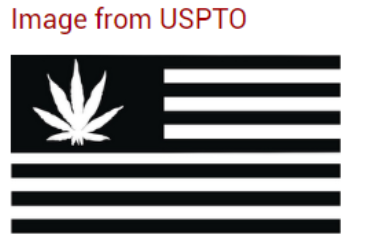 Here we have considered a fairly general overview of the U.S. marijuana IP landscape, with an additional focus on trademarking in particular. 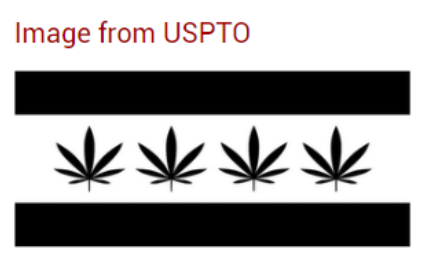 Additional posts will explore the complex state of patent application and granting processes faced by players in the American marijuana industry, the potential movement of big agriculture from weed-killing into weed-growing, and considerations of cannabis IP strategies from an international perspective. Be sure to check out the second installment in our Cannabis series where we investigate the potential movement of Big Pharma and multinational agricultural corporations into the cannabis space.